Are you ready for football season!? 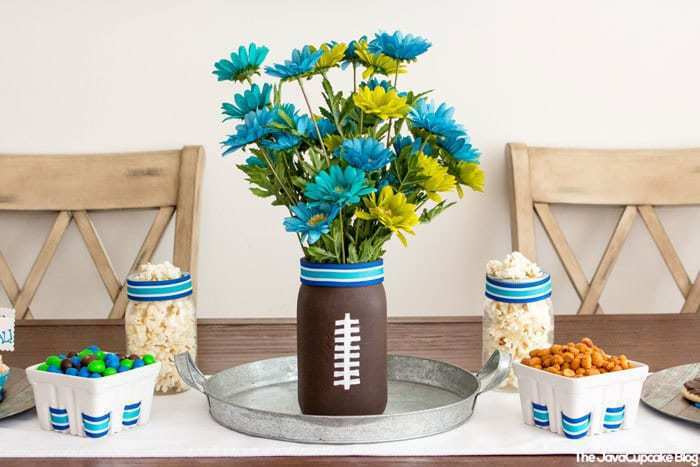 With these football party decor ideas, you’ll be ready anytime your friends and family want to come over to watch a game! This post is sponsored by M&M’S®. All ideas and commentary are my own. Have you ever been at CVS and a big stack of candy on the end of the isle catches you eye and you have to bring it home with you? That happened to me when I saw these M&MS® Brand Chocolate Candies Game Day Mix. These M&MS® have football helmets, goal posts, and footballs printed on them as well as the classic “M”! So super cute and perfect for the upcoming football season! I decided that I needed to have a few friends over for a preseason game and somehow incorporate the M&MS® into my decor and tablescape. The first thing I do when planning the theme of any tablescape or party decor, I decide on colors. My favorite football team colors are green and blue so I used those. You can easily choose any color combination for your party. After the colors are chosen, I decide on the centerpiece or the main focal point of the decor. 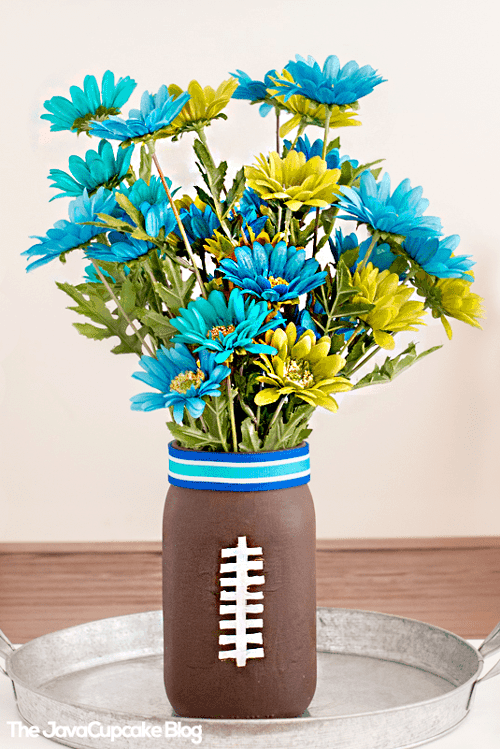 I always like to include one DIY item in my party decor and decided to to paint a mason jar like a football to serve as a vase for flowers. 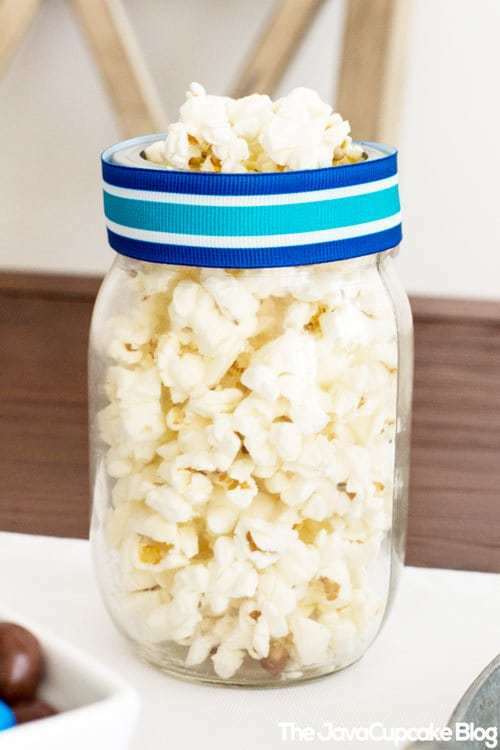 Ensure the jar is clean and dry before you begin. Line your work surface with paper towels or other protective covering. Using the white paint marker, dry the stitching of a football on the side of the jar that is flat with no writing. Allow the paint to dry completely. Fill the jar with your favorite flowers. I chose coordinating blue and green flowers to match the theme, but any flowers would work… fresh or silk. 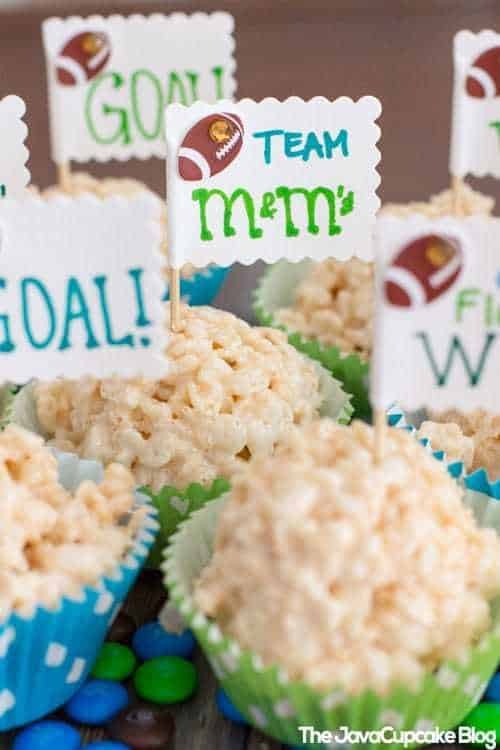 I knew I wanted to incorporate the M&MS® Brand Chocolate Candies Game Day Mix in a nontraditional way. They couldn’t just be baked into a cookie or used to top cupcakes, I really wanted the chocolate candies to stand out on the table! 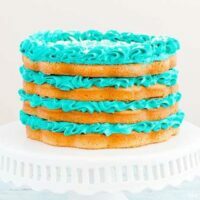 I found two inexpensive chargers that matched the color them of the party and planned to use those to hold the desserts. I placed blue, green, and brown M&MS® under the cookies on the charger. Doing this not only carried the color theme to the plate, but it added a fun added touch to the display. 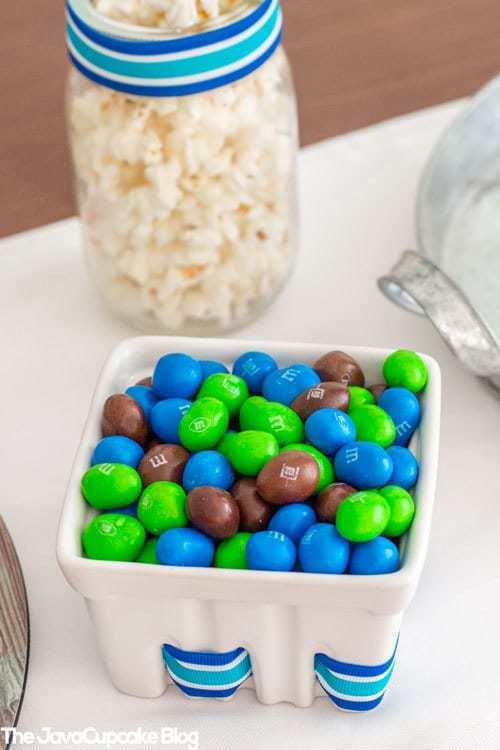 The table wouldn’t be complete if I didn’t have a big bowl of M&MS® to snack on during the football party. I used the same ribbon on the painted jar to weave into a ceramic berry box and filled it with more M&MS®. This is an easy way to turn a boring bowl of candy into something interesting on the table to look at. To keep the football theme going, I made sugar cookies topped with chocolate buttercream in the shape of footballs. 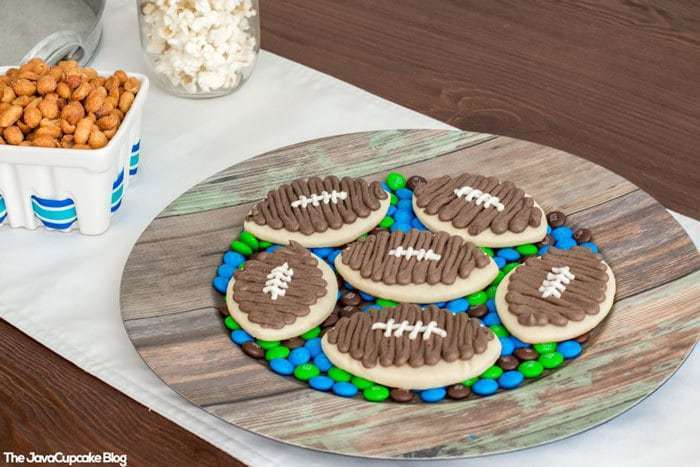 Even if you didn’t have time to make cookies from scratch, you can buy pre-made dough or even a box mix from CVS and cut them out in the football shape. Super easy and they make a big impact on the overall theme of the table. 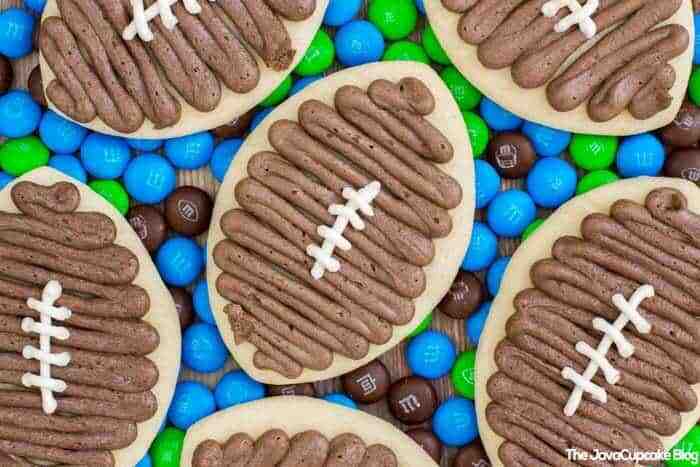 I just love how the football cookies jump of the plate on top of the colorful M&MS® Brand Chocolate Candies Game Day Mix! 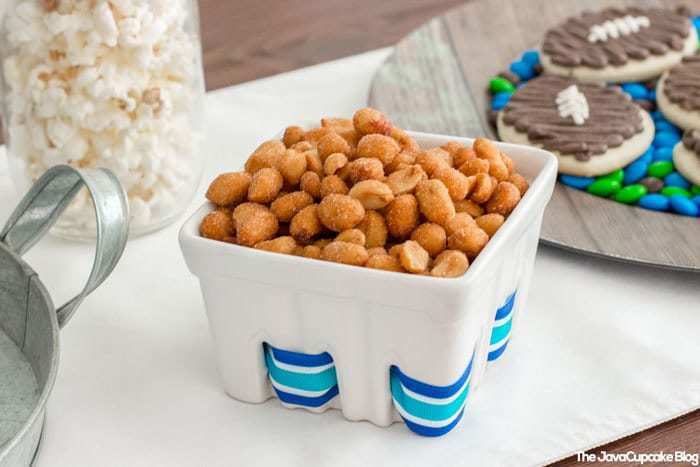 Again, instead of just putting out popcorn and peanuts in simple bowls, I added a touch of drama by using mason jars and ceramic berry boxes. Using the same ribbon on all the jars and bowls helps to create consistency in the overall theme and brings the color palate to every aspect of the table. Using toothpicks and paper (both of which you can find at CVS) you can create treat flags to top any bite sized dessert. 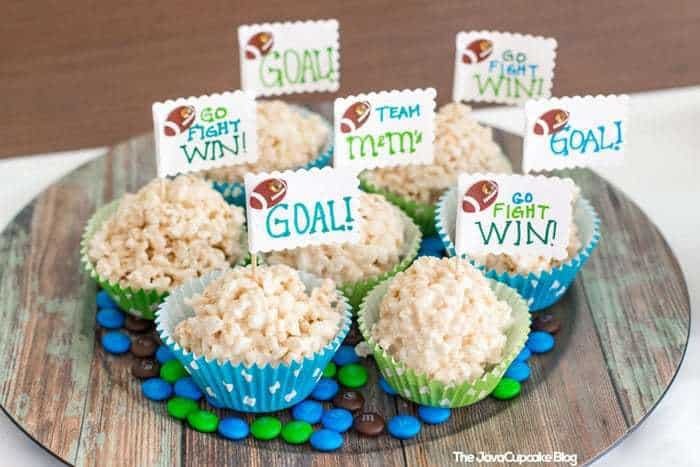 For this party, I topped individually portioned marshmallow cereal treats with flags adorned with footballs and common football phrases. My personal favorite… Team M&MS®. I mean really… when you’re on Team M&MS®, you can’t lose! 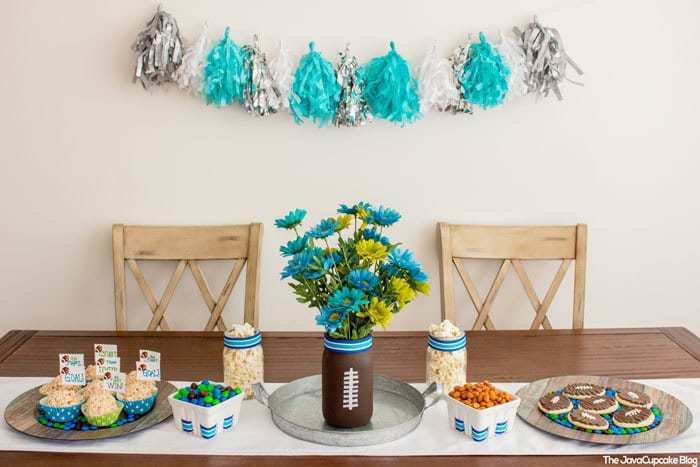 Whether you’ve got a party coming up or you’ve found some last minute inspiration while shopping at CVS, these Football Party Decor Ideas are sure to give you some great inspiration! 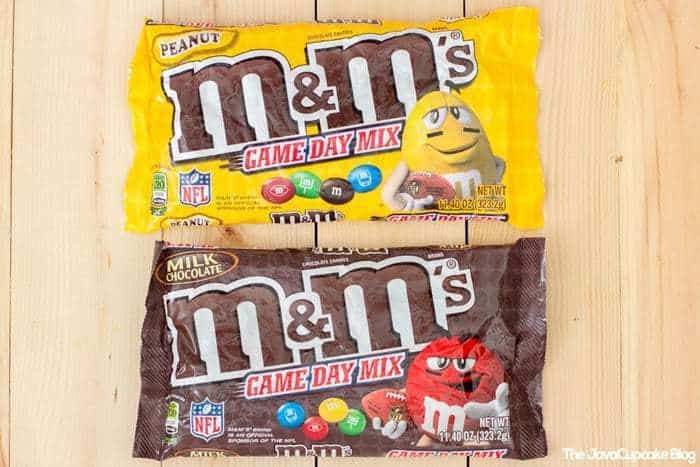 You can find these M&MS® Brand Chocolate Candies Game Day Mix only at your local CVS store! Use this locator to help you find the one nearest to you! So long, farewell. Auf Wiedersehen, adieu. As many of you know the last 2 years have been a difficult journey for me. My husband’s PTSD from 8 years at war finally reared its ugly head and changed our lives forever. We went from living a safe, secure life in Germany to being civilians trying to navigate the transition while still putting food on the table. It’s been a rough odyssey for all of us. Being back in the USA and being able to take part in the Dog Tag, Inc Fellowship Program has opened my mind to the possibilities of my life. I don’t know if I would have discovered so many things about myself if I did not have the safe place of Dog Tag to do so. Mourning the loss of being an active duty Army Wife is harder than I ever imagined. Being a proud Army Wife was a label I was so proud to wear and did everything I could to fill the role with duty and honor. It became not only what I did, but who I was and I truly loved every minute. Since 2009, blogging has been a big part of my life. It filled my spare time, it gave me a community of wonderful other bloggers to connect with, and it helped me travel around the world. Most importantly, it gave me 7 years of experience building my own brand and social media & online marketing expertise which I am now cultivating as an option for the next step of my life. Today, I have the label of Caregiver and although I take the role just as seriously, this role isn’t as fulfilling as I thought it could be. I find myself wanting to do more and be more. Caring for my husband is an important job, but it can’t be everything I am. I want more. I need more. 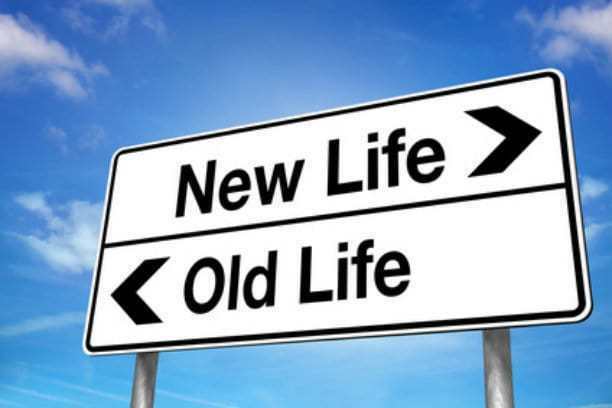 I no longer want the labels of my past to be who I am today or in my future. The passions I had as an Army Spouse and Food Blogger are no longer as strong and I’m feeling called to do bigger and better things. What those things are… I’m figuring out now. What does all this mean? It means that I’m turning the page on one chapter of my life and opening it to the next exciting adventure. The Dog Tag, Inc Fellowship Program has allowed me to explore who I am in a deep way. I have began to realize my true potential and hone in on my strengths. And to be honest, I’ve been shown my weaknesses and have been allowed to go through the process of figuring out how to change those behaviors. 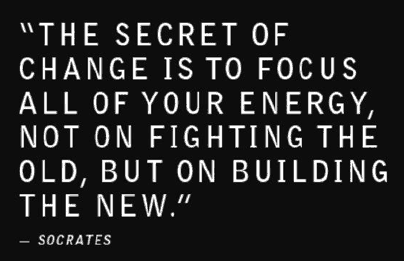 I’ve done more growing and learning over the last 2 months than I have in the last 10 years. I have never felt more alive! That last one is the biggest motivator for me. I am worthy of success. I am worthy of greatness. I am worthy of chasing after my dreams. 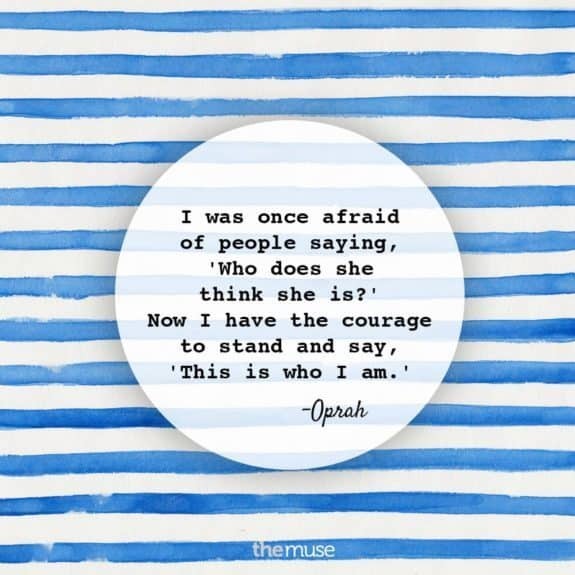 I am worthy of being amazing! 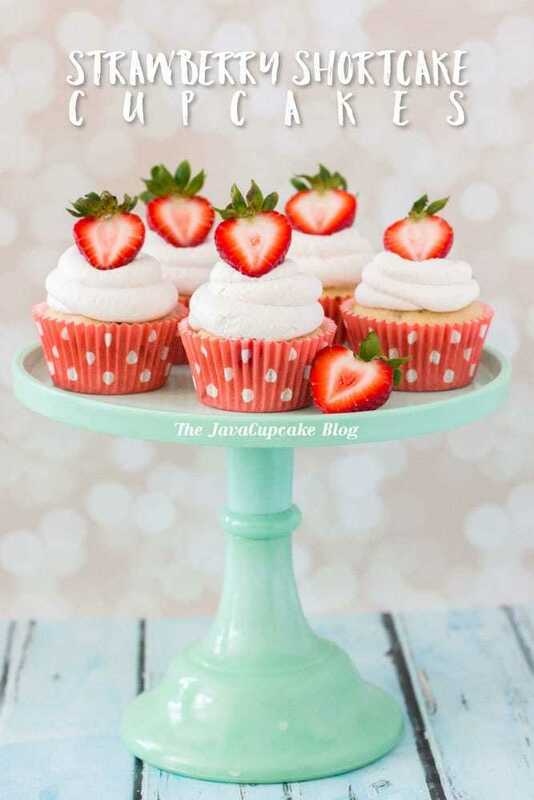 Going forward, I will no longer actively be adding new content to The JavaCupcake Blog. It’s been an amazing 7 1/2 years creating and sharing on TJCB. I’ve created so many things, met so many incredible people, and I can honestly say I’ve been so fulfilled by the entire process. However, it’s time for me to move on. I never thought those words would come out of my mouth, but when they did I felt a sense of relief and I knew it was the right decision. I have 4-5 recipes and DIYs I’ve already created that I’ll be adding to the blog this week, but after that I’ll be done. I don’t know if I’ll ever come back to TJCB, but I know if I do… all my wonderful readers will be right there waiting for me. You guys have been so loving, supportive, and loyal and I can’t thank you enough for all your love and support of me over these years. 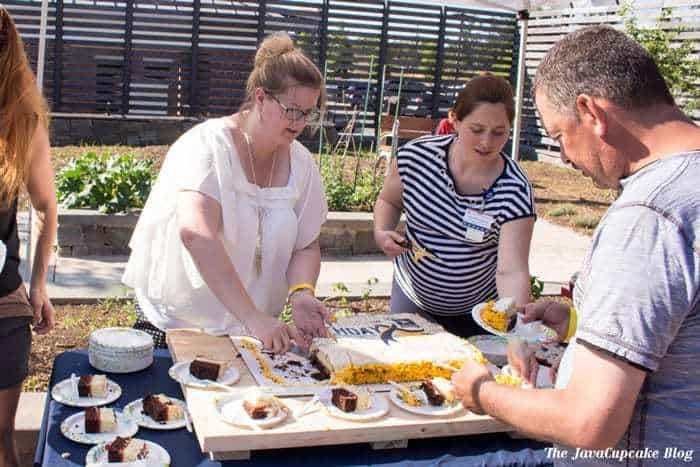 Being able to be a part of your lives, your families lives and the special moments you have has been heart warming and I loved every photo and comment you shared about how my recipe made your party or event special. I will never forget that and how your love made me feel. 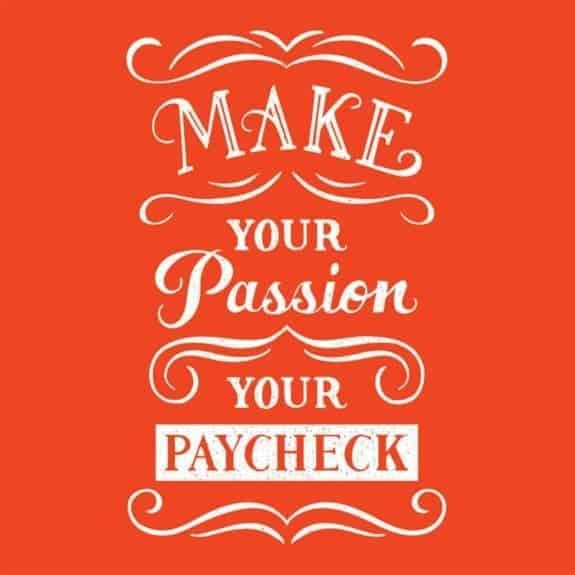 My future is still unknown at this time, but I am working fiercely on turning my passions into a paycheck! On September 1st, joined the team at the Yellow Ribbon Fund, a non-profit veteran service organization, to be their Family Caregiver Program Coordinator. I’ll be planning and hosting events for caregivers & families of wounded service members & veterans in the Fort Belvoir, VA area! Community organizing has always been a part of my life and a passion and I’m so excited to be working in the military community doing this! I will be completing the Dog Tag, Inc Fellowship Program and in turn receiving a Certificate of Business Administration from Georgetown University in November. Two great additions to not only my resume, but my life as a whole! I began consulting with two local non-profit veteran service organizations to help them strengthen their social media & online presence. With the encouragement of the staff at Dog Tag, I realized that I could turn this passion into a paycheck! There is a need within this NPS VSO community for my services and I’m going to do everything I can to fulfill that need! Which means… I started my own consulting firm! Be Creative Consulting, LLC was born in July but wasn’t officially named or licensed until September. I am in the process of setting up my online presence for this new venture and am excited to grow my client list in hopes to either get a full-time position doing this for a NPO or to consult full-time for many organizations. Now all of this doesn’t mean I’ll be gone away completely. I’ll still be sharing my life on Instagram and Facebook so you can keep up with my adventures there! I have never been more excited for my future and I feel so incredibly thankful for the opportunities in front of me! Love to you all! Ripe, juicy peaches, crumbly topping and sweet icing make this Fresh Peach Coffee Cake the perfect summer breakfast treat! 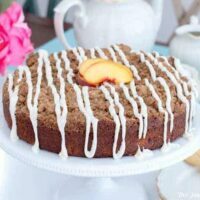 I really had no other reason to make this fresh peach coffee cake than I just wanted to. 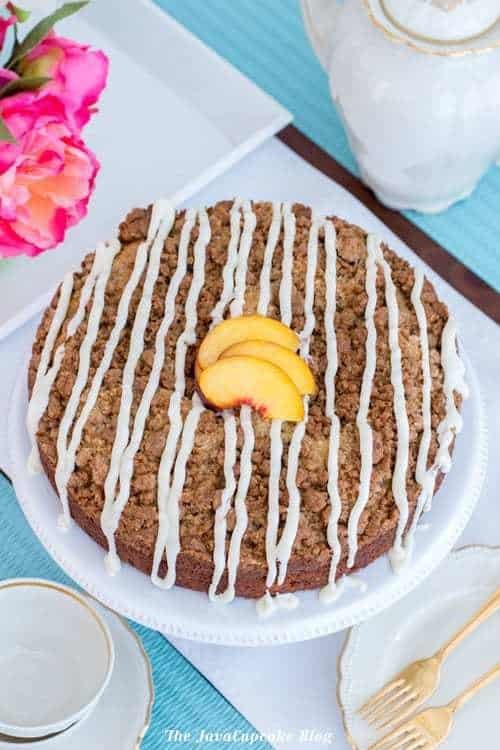 It’s peach season, the sun is shining, and I wanted a delicious breakfast cake to have in the morning at work! Do I really need any more reason than that? 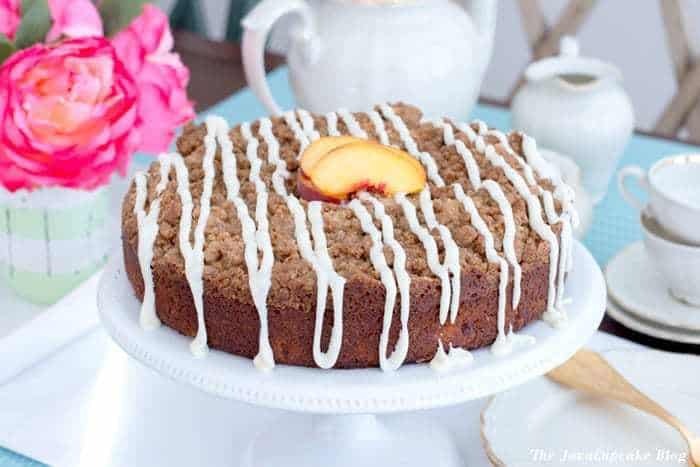 So this coffee cake is subtle in flavor in the cake, but the peaches pack a huge flavor punch! 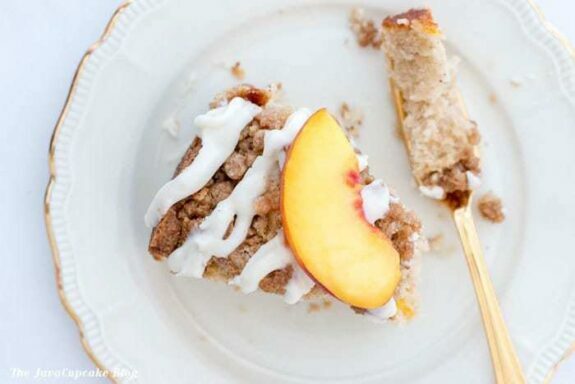 I honestly don’t know which part I like more, the juicy peaches inside or the crumbly goodness on top. 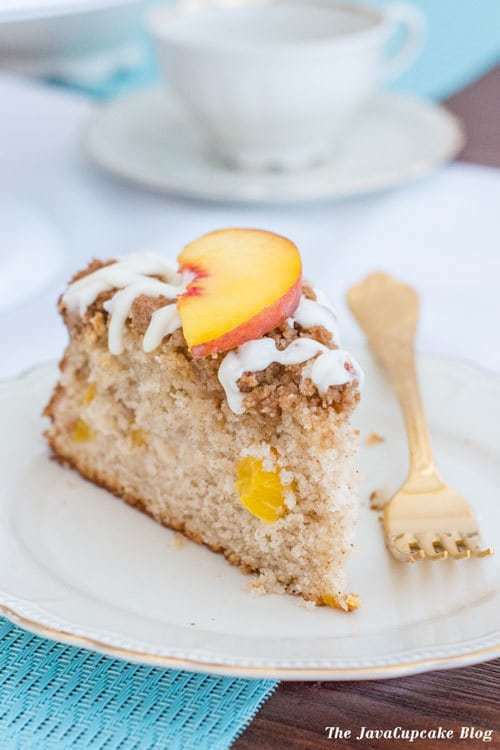 And let’s be honest here, I don’t always eat a lot of what I bake… but I didn’t share more than one piece of this peach coffee cake with my family! In fact, I put a big DO NOT EAT sign on it so they’d stay out and I could enjoy a piece every morning until it was gone. Maybe I should make another one. Preheat oven to 350F degrees. Grease and flour a springform pan. In a large bowl, stir together flour, baking powder, cinnamon and salt. In the bowl of your stand mixer, cream together the sugar and butter until light in color, about 3 minutes. One at a time, add the eggs and beat until combined. Mix in the vanilla. Make sure to scrape the sides and bottom of the bowl to ensure everything is incorporated. Alternate adding the dry ingredients and milk to the wet mixture making sure to beat well after each addition. Toss the peaches in the 2 Tbsp of flour and fold into the batter. Pour batter in to prepared pan and smooth out until level. 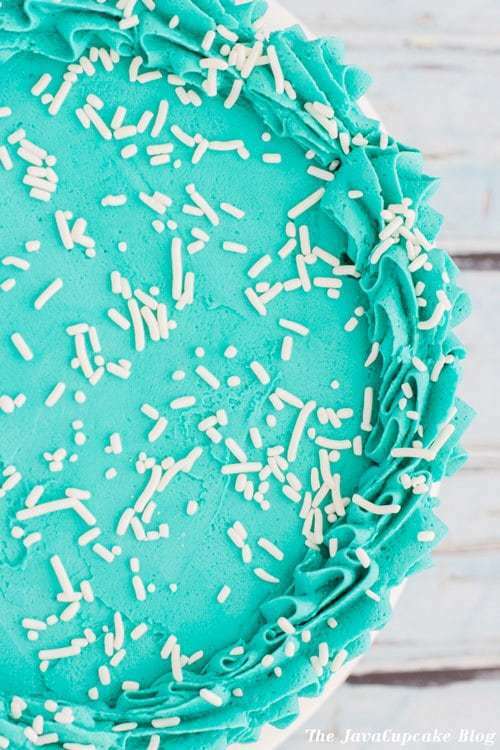 Sprinkle the topping over the top of the cake until covered then bake an additional 20-30 minutes or until a toothpick comes out clean from the center. Combine sugar, flour, and cinnamon in a small mixing bowl. Add butter and mix incorporated. It will look like wet sand. In a small bowl, whisk together the sugar and milk until smooth. Recipe originally from Barbara Bakes. Are you looking for a delicious summer treat? 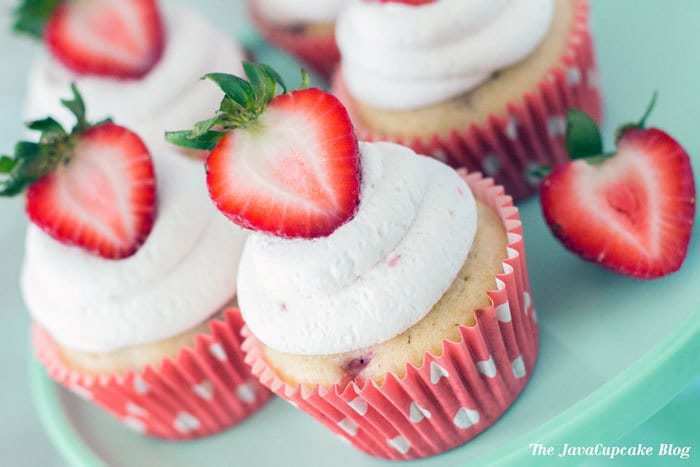 These Strawberry Shortcake Cupcakes are packed full of fresh berries and topped with a delicious whipped cream and are prefect the perfect dessert for summer! It’s been a minute since I’ve posted a new recipe. Starting the Fellowship Program at Dog Tag, Inc has taken up more of my time than I imagined it would and I’ve found myself savoring every free moment with my family and getting as much sleep as possible. There was no reason to make these cupcakes other than I had a bit of free time just as the fellowship was beginning and I wanted to get in the kitchen and bake! I started with a shortcake cupcake recipe from Damn Delicious as the base of this cupcake. I doubled the recipe and decided to top it with fresh whipped cream instead of buttercream. When I think of how I like to eat strawberry shortcake it’s always topped with fresh whipped cream. These cupcakes could be no exception. Instead of using plain whipped cream though, I made a strawberry syrup to add to the cream to give it a sweet, subtle flavor. 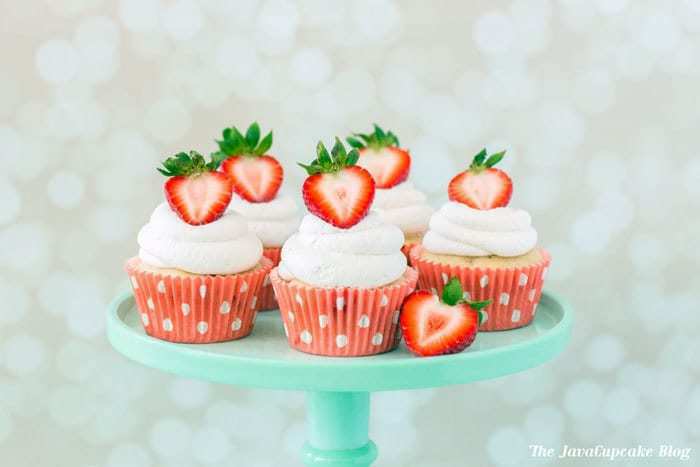 When I shared these cupcakes with the fellows at Dog Tag the frosting got rave reviews! 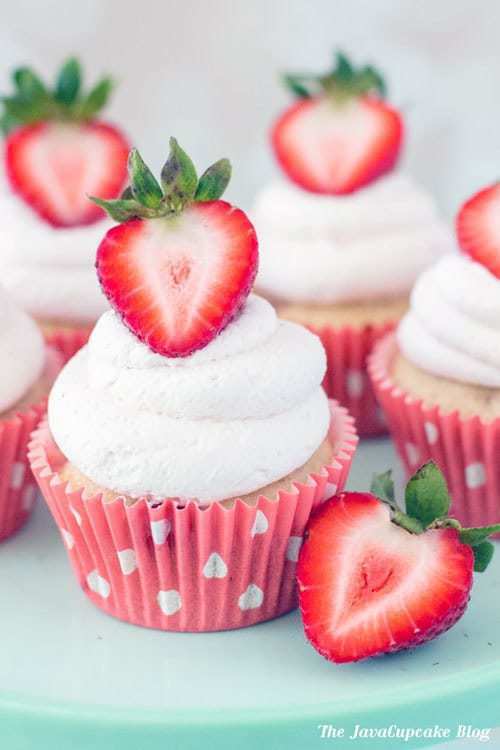 With strawberries in season now, I highly recommend making these Strawberry Shortcake Cupcakes. They are simple to make and oh so yummy! Preheat oven to 350F degrees. Line a cupcake pan with Sweets & Treats Boutique pink dot grease proof liners. In a large bowl sift together the flour, cornstarch, baking powder and salt. In the bowl of an electric mixer fitted with paddle attachment, gently cream together the sugar, eggs and vanilla for 2-3 minutes. Add the vegetable oil and melted butter and mix until combined. In another bowl, toss the diced strawberries in 2 Tbsp of the sifted flour mixture. Add the sifted flour mixture and milk alternately in 3 parts beginning and ending with the flour. Mis only until just incorporated. Add strawberries and gently fold by hand to combine. Bake 18-20 minutes or until a toothpick comes out clean. Allow the cupcakes to cool in the pan for 5-10 minutes before removing to a wire rack to cool completely before frosting. In a shallow pan, combine the water, 1/4 cup sugar, and 10 diced strawberries and cook over medium-high heat until the sugar melts. With a spoon or potato masher, mash the berries until no more chunks remain and the mixture is mostly liquid. Cook over medium high heat until the sauce thickens and reduces by about half. Immediately strain the sauce to remove any chunks of berry that remains. Allow the remaining syrup to cool completely in the refrigerator. 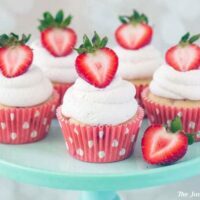 In a chilled bowl for your stand mixer fitted with the whisk attachment, combine the heavy cream, chilled strawberry syrup and sugar with the mixer on low. Turn the mixer to high and whip until semi-stiff peaks form. You want the whipped cream to hold its shape when piped onto the cupcakes. 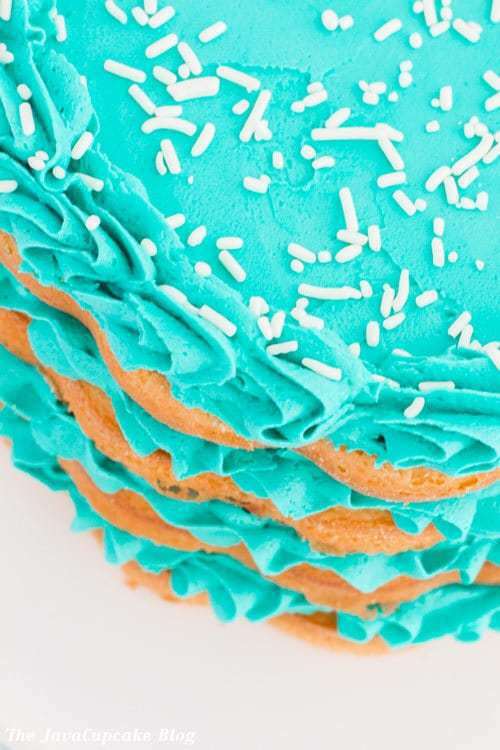 Using an open round tip fitted to a piping bag filled with whipped cream frosting, pipe swirls of frosting on to each cupcake. 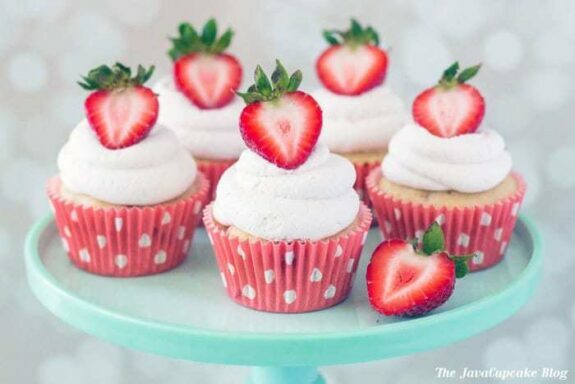 Topped each cupcake with half a strawberry. Serve immediately or store chilled for up to 2 days. 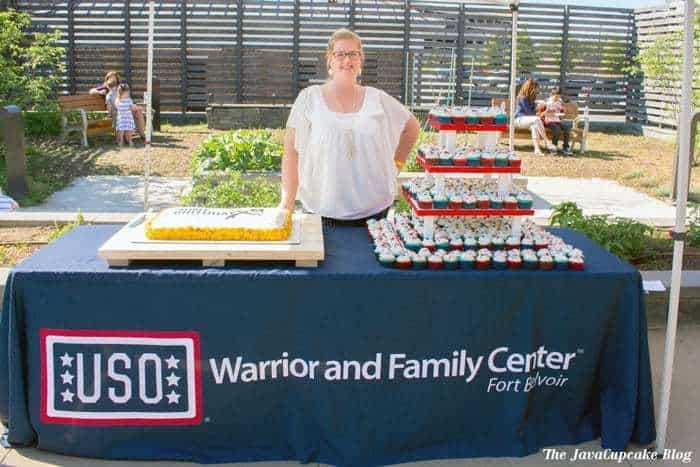 Last month I had the privilege of making the US Army Birthday Cake for their 241st birthday party hosted by the USO Warrior & Family Center at Fort Belvoir, VA! 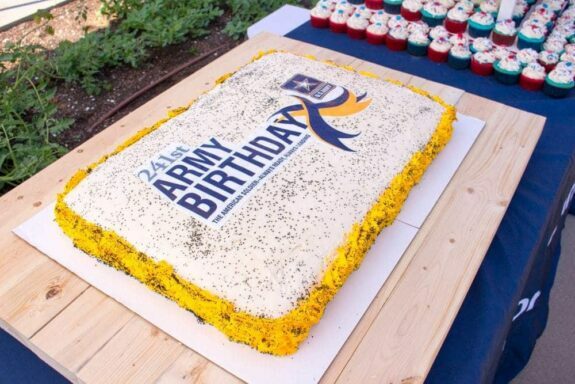 When the USO Warrior & Family Center at Fort Belvoir asked me if I’d be willing to make the birthday cake for the Army’s 24th birthday party, you don’t say no… even if you’ve never made a sheet cake before! It’s not like I’ve never made a cake before, so I thought a sheet cake wouldn’t be too difficult. 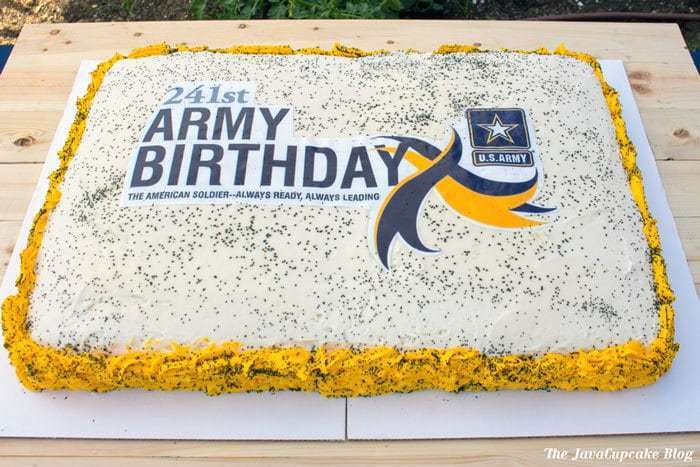 I ordered an edible image from a vendor on ETSY of the official US Army birthday logo and bought supplies in yellow and black to match the Army colors! If I were to do it again, I’d cut the image square and pipe a frosting border around it so it didn’t stick out as much against the frosting. Also, I probably wouldn’t put the black sugar crystals on it because with the heat they ended up melting and just looking messy. However, I was the only one who seemed to notice these things and everyone else raved at how awesome the cake was! 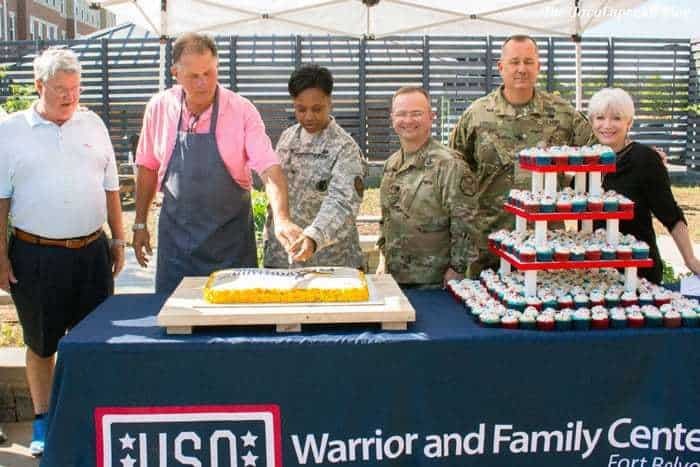 The Fort Belvoir Garrison Commander and her staff were on hand to celebrate the Army’s birthday and to officially cut the cake along with the President of the USO Metro and the owners of the Montgomery Inn Boathouse Restaurant from Cincinnati, OH. 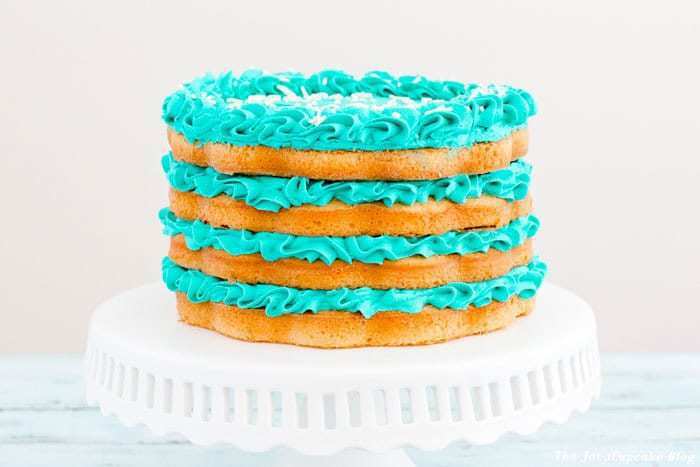 The cake itself was dark chocolate cake on the bottom and classic white cake on top with fresh raspberry filling all covered in whipped cream buttercream frosting. 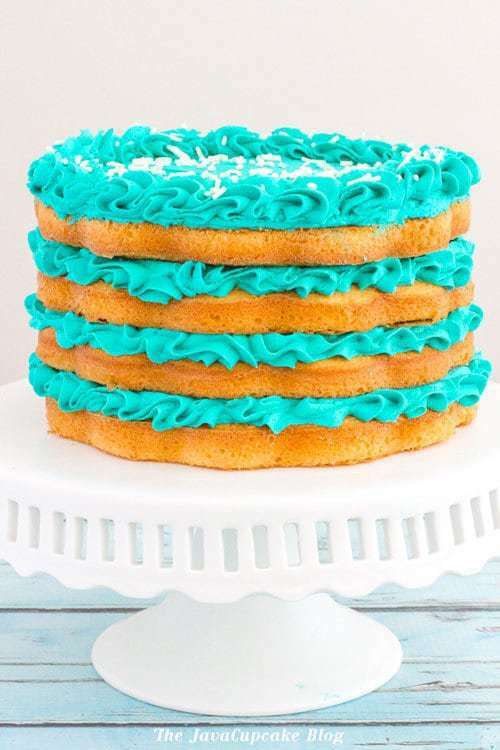 It was a HUGE hit and honestly one of my favorite tasting cakes I’ve ever made! I also made 300 red, white and blue cupcakes for the party, but I already shared the details of those a couple of weeks ago. 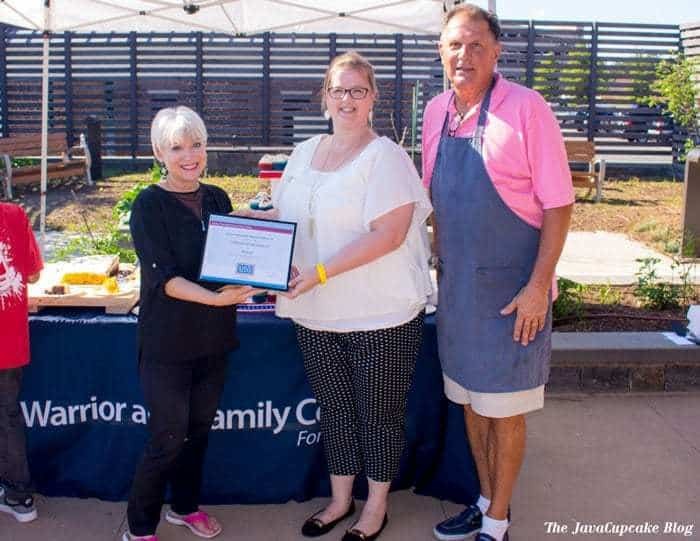 It came as a complete surprise to me, but about half way through the event, the President of USO Metro and the owner of the Montgomery Inn Boathouse Restaurant presented me with a certificate of appreciation for all my time and work serving the military members of our community. It has always been my honor and complete pleasure to serve the military community, especially at the USO. The USO has done so much for my family over the years that it’s the least I can do to give back to them and our community. If you’re in the military and are close to Washington DC, I highly recommend checking out the USO. They are a great resource for the community and have so many amazing activities for service members and families!